A regal display of your wedding details, this ecru shimmer wedding invitation features intricately embossed borders of ornate garland above and below your wording. Your wording is printed in your choice of colors and fonts. Invitation includes inner and outer envelopes. This product features thermography printing. Thermography is a unique printing technique that results in raised lettering you can feel, which adds to the luxurious experience of this printed piece. 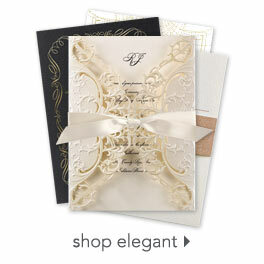 These invites, enclosures, and envelopes are stunning!!!! I LOVE them and can't wait to send them out! The quality of the paper is really great and the printed envelopes are so classy. The enclosure cards compliment the invites so nicely. I can't stop looking at them! Looks so high end without breaking the bank. The customer service is so helpful and responsive, I kept going back and asking for more proofs and they never gave me any trouble about it. THANK YOU!!! Gorgeous, high quality invitations at a great price! These invitations are simply gorgeous! I struggled for a while finding something elegant at an affordable price, but these hit the jackpot! I love the feature of being able to personalize wording, fonts and colors to make it exactly what I was looking for. I ended up using a bit more formal wording with more classical fonts printed in black and they came out perfect! The paper is beautiful, high quality, shimmery cardstock and the printing looks expensive!! It comes out as a very slightly raised lettering that makes them look like they are worth a lot more then they were! The only thing I would have liked to see was additional styles of accessory cards. I ended up recreating the reception card template three different ways to end up with a reception card, accommodations card, and rehearsal dinner card so they look similar, and are all the same size, but still look great! The RSVP card had its own style, which then again I altered to fit my taste and style of our formal, romantic wedding. Overall I would recommend these and any of the other products off this site, as they came out wonderfully and the process was a breeze!! Shipping was fast too!! Love these invitations! The have gorgeous details that make them unique but not tacky. They look really nice without costing a fortune. Only downside is that their length makes it hard to mix and match with different pockets and other invitation accessories. These invitations are absolutely beautiful. They are elegant and look very expensive for a good price. The shimmer just adds to the invitation and the paper quality is really good too. I added black lace ribbon for an added touch since that's apart of my theme but these are perfect by themselves. Delivery was fast. This product came in the mail and was just as described...gorgeous! It's a beautiful invitation and my daughter Brianna was thrilled. It's very hard to do this over the phone, but your wonderful girl helped me for an hour! I owe it all to her...she listened to what we wanted and found it for us...PRICELESS!Thank You! Thank you! Thank you!